As quickly as Tyson Fury changed the landscape of the heavyweight division with his against-the-odds defeat of Wladimir Klitschko, so it fractured again with the IBF immediately splintering off and declaring their title vacant. In their own way the IBF may have done heavyweight boxing a favour as it has cleared a path for two of the sport’s most promising young heavyweights, Anthony Joshua and Joseph Parker, to step up and sign the most significant fights of their respective careers. On April 9th Joshua will face reigning IBF champion, American southpaw Charles Martin in a title fight that the unbeaten British star is heavily favoured to win. And in an equally fascinating mandatory fight scheduled for May, New Zealand heavyweight sensation Joseph Parker will face the vastly experienced and well seasoned 12 year veteran Carlos Takam in a fight that most pundits expect will tell us whether the young Kiwi is the real deal or not. 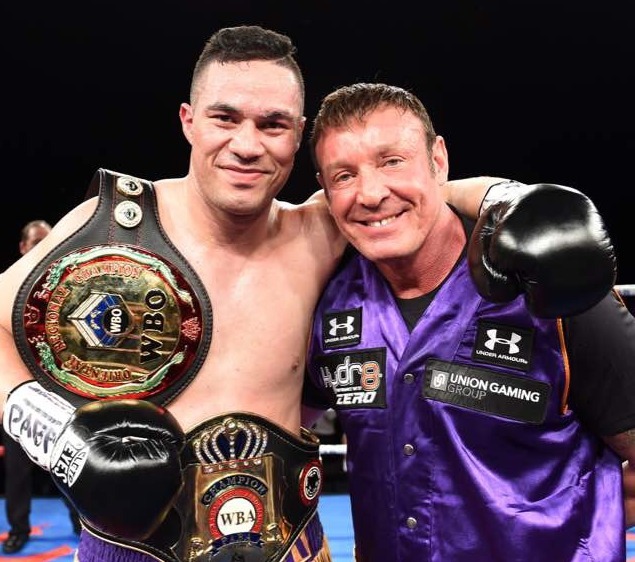 It is a meteoric rise for Parker having only been a professional fighter for a little over three years and having worked with world class trainer Kevin Barry for 13 fights. Eastside Boxing sat down with Barry to get his thoughts on the upcoming fight and why he feels as Parker’s trainer and mentor why it is the right time for his charge to take this fight. ESB: Thanks for catching up with us Kevin, Takam is a huge fight for Joseph and a massive step up. When exactly did Takem come into play as far as negotiations go? Kevin: In truth we’ve been looking at Takam for a long time. In fact last year when we were searching for opponents for Joseph we looked at him then, but at that stage having a lot of respect for Carlos Takam it is a fight we delayed making until it meant something. And with this fight now being an IBF title eliminator it actually means something. ESB: As you know critics often like to have a dollar each way. Last year there was criticism that Joseph wasn’t maybe being stepped up enough and now I’ve read in some places people are saying that a guy like Takam is too big a step up. What is your take on that? Kevin: I’ll back Joseph against any one. Does that mean he beats everyone? I don’t know we haven’t gone there yet. But here’s the thing about Joseph Parker, he has been fighting very much within himself, there is a lot more to come out of Joseph Parker and I believe that a fighter like Carlos Takam will bring the best out in him. He’s ready for this kind of step up, he and I have talked about it a lot. We could have easily left this fight for the next rotation of mandatory fights which would be something like another year, a year and a half possibly, but we felt the time was right now. We know this is a big step up, we know that Carlos Takam is a very big, very powerful and aggressive fighter and the type of fighter that a lot of people just don’t want to fight. ESB: It has the potential to be a very exciting and explosive fight with a lot of ebb and flow. Kevin: Most definitely, Carlos Takam is an 11 year seasoned fighter who has been very active with 3 fights in both 2014 and 2015. He’s very highly rated by many organizations, and take the Povetkin fight, he was in a life or death fight with him before Povetkin got him out of there in the 11th round. Joseph is going to have to be very disciplined and really follow our fight plan. It’s the kind of fight where if Joseph can’t control the distance and allows Takam to get into the middle zone it’s going to be a very hard fight for us to win. ESB: It strikes me as the kind of fight where Joseph is going to have to systematically break him down rather than take him out with one shot. Kevin: Most definitely. This is a fight where he is going to have to wear his opponent down, control the fight with his jab and just win it round by round. Having said that I’ve watched a lot of Takam’s fights and he is a very aggressive come forward type fighter which I prefer for Joseph. I like fighter’s that come to Joseph rather than him having to chase them around the ring. ESB: I know Joseph did really well in sparring last year with two former world champions in Bermane Stiverne and Wladimir Klitschko. Was his progress and good work in those camps part of the reason you are confident he can step it up against Takam? Kevin: Yes all those things are huge for Joseph’s confidence and his self belief, and not just for him but for me as well as his trainer. When he does perform so well against experienced guys they are major plusses for us on the mental side. ESB: Sparring-wise I assume you are going to try and hire some high quality fighters who can try and replicate Takam’s style? Kevin: Yes, Takam’s style can be a little unorthodox a times and hard to replicate but we are looking at trying to get in the best quality sparring partner’s that Joseph’s ever had, but no-one that I would be prepared to name at the moment. We are looking for aggressive guys, guys that come forward. ESB: I’ve read in a few different places that some people consider this fight for Joseph a potentially harder fight than Charles Martin will be for Anthony Joshua. Kevin: Most definitely. We have a lot of hard fights moving forward and this will be the start of them. This is a fight where a lot of people think we’ve gone in over our heads, but this is a fight that will bring out the best in Joseph Parker. ESB: How excited is Joseph for this fight? ESB: That being said, how important is it as his trainer to make sure you keep him on an even keel and make sure he doesn’t get too excited and emotional for this fight? Kevin: Well it’s up to me to be very aware and keep my eyes open to spot any changes, no matter how small they are in his preparation for this fight. We know what works as a team and any deviation from what we’ve done in the past will be stamped out quickly. ESB: I guess as more media demands, particularly from New Zealand come in you will have to step in more often and insulate Joseph from those pressures to some extent? Kevin: Correct and I have no problem doing that. But here’s the thing, we are also well aware we do have a lot of media obligations right now but Joseph’s grown into that role and he’s been tremendous with the media in the last couple of years. It’s when you take it as a chore that it starts to weigh down upon you, but this is part of your learning and part of promoting the fighter that you are. ESB: I know the English media are starting to take a more active interest in Joseph lately. I guess they see a fight with Joshua as something that may happen sooner rather than later? Kevin: If Anthony were to beat Charles Martin to take the title and we were to beat Takam then Joseph becomes the mandatory to fight Anthony for the championship. I’ve always said it will be inevitable that they will share the ring together and it will be a very very big occasion. We’ve always paid attention to Anthony Joshua because of this and we know he’s paid attention to us as well. ESB: With Joseph also living with you and your family in Vegas it must feel like quite a special time in your house right now? Kevin: Through the experience I’ve had over the years we tend to not get too much wrapped up in the hype, we just go about our business day by day, but it is a very exciting time and hopefully we get a good result and we can take Joseph that one step further toward the heavyweight championship of the world. If you can summarize the training methods of Kevin Barry in one word that word would be ‘meticulous.’ One would expect that in the coming months he will not only pour over hours of tape on Carlos Takam, scrutinizing the tough Cameroonians strengths and weaknesses but also to devise a strategy for Parker that utilizes his laser-like jab and world class speed. If he can, then Joseph Parker stands a very good chance of winning his IBF title eliminator to potentially face Anthony Joshua in what would be a dream match-up for a division that looks set to ignite over the next 12 months.